To achieve excellent results from your NYC FUE hair transplant get in touch with Dr. Thomas Law today. Dr. Law is a leading NYC hair transplant surgeon with international recognition. With his assistance, you can explore modern, ultra-refined hair transplant procedures, get comprehensive hair loss treatment advice, and undergo the best hair restoration procedure. Dr. Law and our team of knowledgeable and experienced medical technicians provide helpful information on the latest developments in the hair transplant industry and medical breakthroughs. They also use Follicular Unit Extraction or FUE procedure to restore thinning hair safely and successfully. 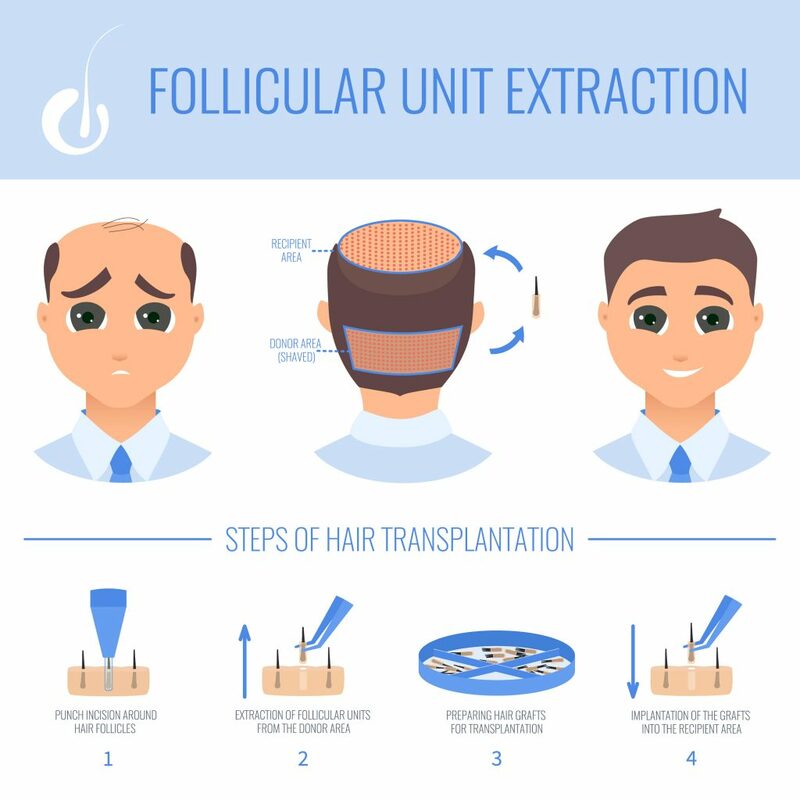 Follicular Unit Extraction entails the extraction or simply harvesting of donor hair in form of a follicular unit. A specialized instrument is used to make a circular incision into the skin that surrounds the follicular unit. This separates the unit and the surrounding tissue. After this separation, the unit is pulled or extracted directly from the donor’s scalp. This leaves a small scar or open hole. This procedure is repeated till the surgeon harvests sufficient follicular units. Depending on the required number of follicular units, the procedure can take several hours. In a larger session, it can be done in two days. The wounds on the donor scalp heal within 7 to 10 days. Only tiny scars that are buried in their hair remain at the sides or back of the head where the units are extracted. Dr. Thomas Law and his team of knowledgeable and experienced medical technicians provide the best FUE hair transplant in New York City and Staten Island. Our team acknowledges the fact that FUE is an instrument-dependent procedure. As such, we use state-of-the-art tools to perform this procedure because we know that the used instruments have a significant impact on the outcome. Using modern instruments to perform this procedure enables us to achieve excellent results in every procedure. In fact, we perform all FUE hair transplant procedures using innovative technologies. What’s more, we know that FUE hair restoration evolves continuously. Therefore, Dr. Law and our entire team of physicians keep learning about the procedure and latest development. This combined with our use of state-of-the-art instruments has made many people recommend us to their friends and relatives after undergoing FUE hair transplant procedure at our facility. Why Trust Dr. Thomas Law with Your FUE Hair Transplant Procedure? For many years, Dr. Law has been at the forefront of the implementation and refinement of this new hair restoration approach. And, we are proud of the amazing results that Dr. Law and our team have achieved with this procedure over the years. Today, Dr. Law is a world-renowned hair transplant surgeon due to his ability to deliver exceptional results in every procedure that he performs. His genuine concern for the care and comfort of the patients combined with our use of innovative instruments makes our facility a preference for patients that want to undergo FUE hair transplant in Staten Island and NYC. What’s more, our medical technicians are always an integral part of this practice. Each member of this team has placed countless grafts during this procedure. This guarantees you a faster, safe, and effective FUE procedure once you choose our hair transplant facility in Staten Island and NYC. Are you battling with a hair loss problem? Do you have a receding hairline?Do you need a lasting solution for your hair loss problem? Then schedule your consultation with us today. Our FUE hair transplant is an established hair restoration procedure. And, Dr. Thomas Law has enabled many patients to restore full hair on their heads with this procedure. Dr. Thomas and our team of medical assistants will deliver excellent results with almost no scarring signs.